Ivanka Demchuk (Ukrainian, 1990–), Baptism of Christ, 2015. Mixed media on board on canvas. Arsen Bereza (Ukrainian, 1989–), Baptism of Christ. Acrylic on metal on board. Natalya Rusetska (Ukrainian, 1984–), Baptism of Christ, 2013. Tempera on board, 18 × 18 cm. Danylo Movchan (Ukrainian, 1979–), Baptism of Christ, 2016. Tempera and gold leaf on gessoed board, 40 × 30 cm. Danylo Movchan (Ukrainian, 1979–), Baptism of Christ. Tempera and gold leaf on board. 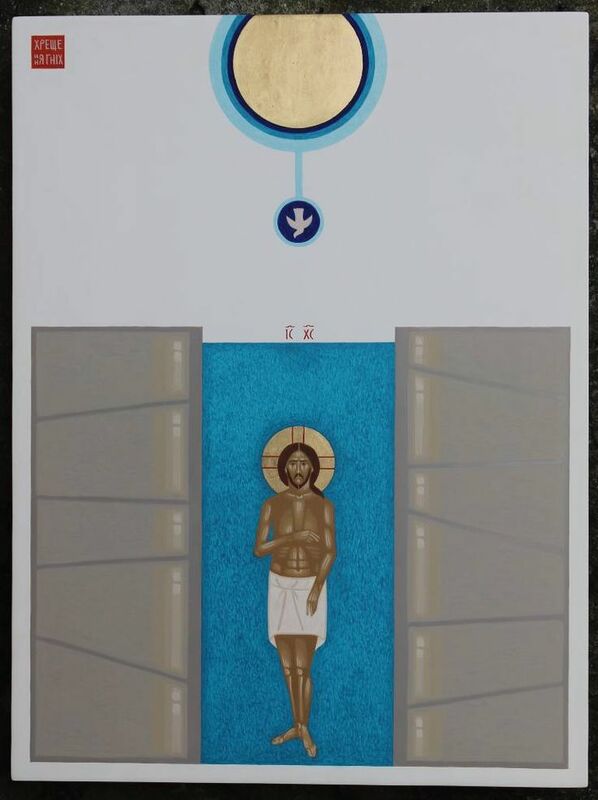 Sviatoslav Vladyka (Святослав Владика) (Ukrainian, 1975–), Baptism of Christ, 2016. Acrylic, tempera, and gold leaf on board, 40 × 24 cm. Vitaly Melnichuk (Виталий Мельничук), Baptism of Christ, 2009. Khram Prepodobnogo Serafima Sarovskogo (Temple of St. Seraphim of Sarov), Bilibino, Chukotka, Russia. George Kordis (Greek, 1956–), Baptism of Christ. Egg tempera on wood, 75 × 55 cm. Ioan (John) Popa (Romanian, 1976–) and Camelia Ionesco-Popa (Romanian, 1979–), Baptism of Christ, 2003. Fresco. Sanctuary of Monte Sant’Angelo, Mount Gargano, Italy. Detail of fresco in progress by Ioan (John) Popa (Romanian, 1976–) and Camelia Ionesco-Popa (Romanian, 1979–), 2003. Sanctuary of Monte Sant’Angelo, Mount Gargano, Italy.